A trip to Bailadila wasn't on my agenda when I arrived at Chhattisgarh. But a meeting with Pratap Agrawal, a feisty Jagdalpur lawyer who keeps the state government on its toes with his various petitions, convinced me otherwise. "You must see the Shankhini and Dankini, they are the worst polluted rivers in Asia," he told me. Curiosity piqued, I decided to make a 41-km detour from Dantewada to Kirandul (the Bailadila industrial area is divided into two mining towns, Bacheli and Kirandul). How bad could these two perennial rivers in India's rural hinterland be; compared to what I'd seen of the Hooghly in Calcutta and Yamuna in Agra? Local lore has it that the rivers were named after two female demons--Shaakini and Daakini--dating back to the mythological age of Rama. The rivers merge with the Indravati further east, and are sacred to the adivasi population who live along its banks.Shankhini emerges from the Bailadila mountain range, a chain of deep green hills, capped in mist, perched 1,260 metres above sea level on the southern tip of Chhattisgarh. 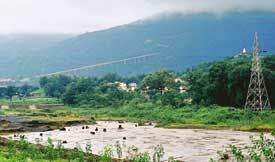 It meets Dankini near Dantewada town by the famous Danteswari temple. Near its source at Kirandul, Shankhini introduced me to a whole new definition of bad. The closest I can come to describing what it looks like here is part viscous bog and part a molten brown liquid that resembles something straight out of Willy Wonka's scrumptious chocolate factory but is sure to taste quite the opposite. No, I didn't attempt to taste. These waters, I wouldn't recommend dipping a toe in, let alone taking a drink from it. Yet people from about 100 villages on the banks of the rivers use it for most of their daily needs. The Bailadila range is known for its high quality iron ore deposits. Fourteen reserves amounting to over 1 billion metric tones of high-grade iron ore were discovered in the range in the 1950s. Since 1961, the National Mineral Development Corporation (nmdc) has been mining three of these deposits. It extracts about 5.5 million tonnes of ore annually, more than half of which is shipped to Japan (3.8 million tonnes a year till 2005 and 2.7 million tonnes as of March 2006). Great steel, iron from these 66 per cent graded ores make. Pushes development forward in distant lands. Builds cities and highrises, cars and those tiny screws that hold your i-pod together. But back home in Dantewada, local villagers are left to live with the byproducts of development, rather aptly called "tailings". For over four decades now, nmdc has been releasing Bailadila mines' tailings--a sludge made of ground rock, iron ore fines and effluent generated during the mining process--directly into Shankini, the nearest surface water source. Some of this slush is held in a tailing dam in Kadampal village at the foot of the mines. Built around 1985 following a National Human Rights Commission directive ordering nmdc to clean up the river, the dam is supposed allow the tailings to settle to the bottom and let the cleared river water flow out. But it doesn't quite work that way. The volume of slurry produced is so high that the dam fills up in no time. It has to be dredged regularly to function effectively and from the looks of it, it isn't scooped out often enough. So the water flowing out retains its dark chocolate colour (which gradually turns a lighter rust red as the river moves on depositing its unhealthy residues along the banks). The slurry from earlier dredges lie piled up in black plateau-shaped dumps along the dam that, according to a 1989-1992 Union ministry of environment and forests' report, have altered the course of several natural streams in the area.The report recommended building tailing dams in locations without direct links with major water bodies. But who's listening. An exhaustive Google search informs me "This type of storage method creates vast environmental liabilities and costs associated with remediation and reclamation." Tailings impoundments, I learn, impact the environment through leaching of acid and heavy metals into water supplies and through dust blowing off them. When they break, the impacts are disastrous for humans and the natural environment. And break they often do. We drive down a narrow unpaved road and park by the edge of the dam. The slurry here is at the bank-level and resembles a dry, black, clayey riverbed. Deceptive. It isn't solid at all. I hurl a few pebbles in. They sink with a soft, heavy sound. My guide, N R K Pillai, who now runs a convenience store in Dantewada and is a local point man of sorts, tells me three children, all siblings, playing on the edge of the dam drowned there few years ago. One fell accidentally and was pulled under, the other two sank trying to rescue the first. I stare at the flat surface and imagine being sucked, in my mouth and nostrils slowly filling with clammy, metallic-tasting sludge. Further along the bank, we come across two villagers walking across the bridge over the dam's sluice gates. Farmers returning from the local market. "For many years now crops don't grow properly on our land," Soma Kumha, whose extended family owns 121 hectares of farmland, tells me. They have to depend on rainwater for irrigation. Fine dust from the mines layers the crop, affecting production. There is no fish left in the river because of its high-suspended solids content, which deprives fish of oxygen. Finding safe drinking water is hard and children, especially, routinely suffer from various stomach ailments. Every year during the monsoons the river overflows and leaves slurry deposits on farmlands. There have been some attempts to address the situation, but none have been followed through to the end. 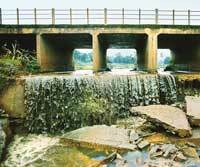 In 1990, the Union government's science and technology cell reported that reckless exploitation of the mines and release of effluent into the rivers had damaged not just the rivers but also 35,000 hectares of agricultural and forest land around Bailadila. Four years later, the then Madhya Pradesh government declared that 65 villages along the Shankhini and Dankini were affected by the polluted waters and ordered nmdc to dig some 200 wells to provide safe drinking water for these villages. The wells were dug all right but were too shallow, says Agrawal. He insists that not one of them is functional today. nmdc officials, of course, don't have to worry about their drinking water. They get fresh and clean natural water piped in from an alternate source 10 km away. So if the tribals can't farm because of mining activities, do they get jobs with nmdc to help make ends meet? I ask A D Nag, president of the local labour union, Samyukt Khadaan Majdoor Sangh (Pillai had picked him up on the way to the tailing dam). Not really, he replies. Adivasis comprise only two to five per cent of the workforce at the mines (the figure for total local employees, tribal and non-tribal Chhattisgarh residents, is around 10 to 15 per cent). At the management level there are no tribal people at all, only two people from Bastar. I take one last look at Shankhini before turning away. It doesn't smell as bad as the Yamuna or Hooghly. Iron residues don't raise a stink, only leach a whole lot of unsafe stuff into the water, including dangerous amounts of mercury. "We have another name for nmdc here," Nag tells me as we drive off. "Never Mind Don't Care".